BRL Test is your EMC EMI Headquarters. Click for Com-Power AH-118 pricing now. The Horn antenna Model AH-118 is a standard broadband double ridged waveguide horn antenna. This antenna is linearly polorized and is designed specifi cally for EMC measurements for the 1-18 GHz frequency range. The AH-118 Horn antenna can be used for emissions and immunity testing. The gain of this Horn antenna is at least 6.1 dBi over the entire frequency range. Model AH-118 can accept up to 300 Watts input power in continuous mode. This antenna is constructed using light weight aluminum with a corrosion resistant conductive coating. The mounting base of Model AH-118 has 1/4 inch x 20 threads. This allows the antenna to be mounted on a tripod (Model AT-100) or a tripod with matching threads. Each antenna is individually calibrated at 3 meters. The calibration data and certifi cate will be shipped with each antenna. Frequency Range: 1 GHz – 18 GHz Input Power: 300 Watts continious VSWR: 2.0 : 1 Polorization: Linear Impedance: 50 Ω Connector type: N Female Weight: 4 lb. max. Size: 7.8″ X 9.5″ X 5.6″ max. BRL Test is your EMC EMI headquarters. Click here to shop now. E4448A at BRL Test. 50 GHz Spectrum Analyzer. Go millimeter. Flexible, easy and fast. Millimeter wave no problem. Phase noise – bam! Spur searches and modulation analysis are a snap. That’s why this a Performance Spectrum Analyzer (the key word being performance.) Get your PSA and rule now! BRL Test is committed to real budget solutions to complex problems. Why pay more? Purchase premium used and certified equipment warrantied and backed by BRL Test’s World Class Repair Lab. Click here for E4448A datasheet and quote form. Anritsu S332E’s Premium Used and Certified at BRL Test for Less. Master the Site Now! Anritsu S332E. Do you want to master the site now? BRL Test makes it affordable with premium used, certified and warrantied. Site Master means you master the site with the power and freedom of this state of the art portable cable and antenna analyzer by Anritsu. Get it done with VSWR, distance to fault, phase, cable loss, spectrum analysis, occupied bandwidth, channel power, spectral emission mask, ACPR, C/I, iterference analysis, spectrogram, signal stength, RSSI, signal ID. On the move and in control with a premium used and certified Site Master. Purchase with confidence knowing that your full warranty is backed by BRL Test’s World Class Repair Lab. BRL Test – We absolutely know Site Masters including the Anritsu S332E. Why pay more when you can accomplish your goals with BRL Test? Call your BRL Test representative now at 866-275-8378. Click here for S332E datasheet and quote form at BRLTest.com. Just in! E8364B Performance Network Analyzer 50 GHz. BRL Test Sale Price $59,900 – Wow! 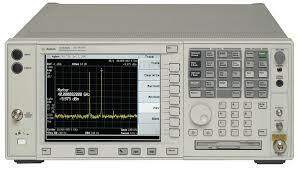 Keysight E8364B is fast, accurate, quiet, sensative and easy to use. Sale priced at BRL Test for a limited time. Click for data sheet and quote form. The PNA’s architecture includes high quality, stable hardware and flexible software. The standard PNA is suitable for testing passive and active devices such as filters and ampliiers. Users can easily add options to test mixers, harmonics, intermodulation distortion (IMD), pulsed-RF, antennas and millimeter-wave (mmwave) components. Purchase easy knowing that you are fully warrantied, certified and backed by BRL Test’s World Class Repair Department. Call your BRL Test representative today at 866-275-8378. BRL Test – We absolutely know network analyzers. Click here for E8364B datasheet and quote request form. N9020-526 Signal Analyzers at BRL Test. Premium Used, Certified and Warrantied for Less. N9020A-526 Signal Analyzer. Premium used, certified and warrantied for less at BRL Test. Keysight N9020-526 Signal Analyzers. Premium used, certified and warrantied at BRL Test for less. Click here for N9020A-526 data sheet and quote request forms at BRL Test. Call your BRL Test Representative today at 407-682-4228. The MXA signal analyzer takes signal and spectrum analysis to the next generation, offering the highest performance in a midrange signal analyzer with the industry’s fastest signal and spectrum analysis, eliminating the compromise between speed and performance. Features a broad set of applications and demodulation capabilities, an intuitive user interface, outstanding connectivity and powerful one-button measurements, the MXA is ideal for both research and development. [N9020A] Sales and repairs at BRL Test. Call BRL Test at 866-275-8378 to Save Now. Unmatched Acquisition and Signal-to-Noise Performance The superior signal integrity and excellent signal-to-noise ratio of the DPO/DSA/MSO70000 Series ensures confidence in your measurement results. High bandwidth, up to 20 GHz, matched across 4 channels Bandwidth enhancement eliminates imperfections in frequency response all the way to the probe tip. The user-selectable filter for each channel provides magnitude and phase correction for more accurate representation of extremely fast signals. In addition, only Tektronix allows the user to disable the bandwidth enhancement for applications needing the highest measurement throughput Simultaneous high sample rate on all channels captures more signal details (transients, imperfections, fast edges) 100 GS/s on 2 channels and 50 GS/s on all analog channels for the 12.5, 16, and 20 GHz models 25 GS/s on all analog channels for the 4, 6, and 8 GHz models 12.5 GS/s on all logic channels in the MSO70000 Series Lowest jitter noise floor and highest vertical accuracy provide additional margin in your measurements Long record length provides high resolution and extended-duration waveform capture Standard 10 MS per channel on the DPO70000 and MSO70000 Series and 31 MS on the DSA70000 Series Optional up to 125 MS on all four channels for the 4, 6, and 8 GHz models Optional up to 250 MS on all four channels for the 12.5, 16, and 20 GHz models On the MSO70000 Series, the record length of logic channels match the analog record lengths for uncompromised analog and digital acquisition MultiView Zoom helps you manage long records, compare and analyze multiple waveform segments With high signal-to-noise ratio and low internal noise floor, the DPO/DSA/MSO70000 Series enable you to perform precise characterization measurements. When debugging a DUT, a low noise floor and maximum signal fidelity of the measurement instrument allows you to find the smallest anomalies that might affect the DUT’s performance. For RF signals, a lower noise floor translates into a higher dynamic range, opening the DPO/DSA/MSO70000 Series to a wider range of applications Widest Range of Probing Solutions – Whether you need to measure 8 Gb/s serial data, fast digital logic, or switching currents from your new power supply design, Tektronix offers a vast array of probing solutions, including active single-ended, differential, logic, high voltage, current, optical, and a wide range of probe and oscilloscope accessories. Premium Used and Certified N9030A Signal Analyzers On Sale at BRL Test. High Performance / Low Prices. N9030A Perfomance Signal Analyzers on Sale at BRL Test.